1. Release the space of your SD and TF card and Backup data on your SD and TF card. 2. Share your photos and videos of your camera on your social network freely any time. 3. For photographers, easy to use, transfer picture to your PC or Mac when you need edit photos. 4. Copy the movie from SD card to your iPhone/iPad/Andorid phone and watch and edit them easily. 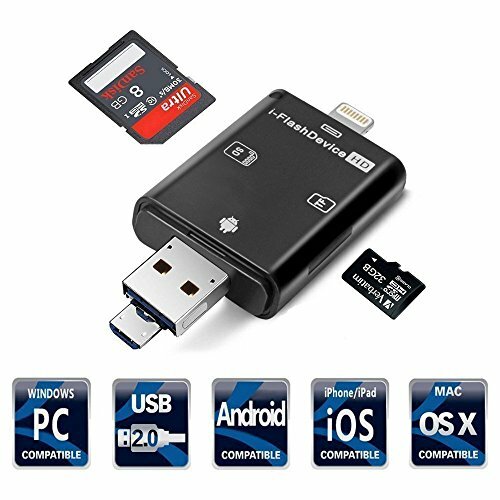 【3 in 1 Memory Card Reader】USB, Micro USB & Lightning 3 in 1 Interfaces are compatible with Android phone, PC, Laptops, Tablets, iPhones, iPad and so on. 【SD/ Micro SD Card Supported】SD Slot for SDHC, SD Card Reader, RS-MMC, MMC Mirco, SDXC. TF Slot for Micro SD, Micro SDHC, Micro SDXC. 【How to use】iOS: When using the Lightning SD Card Reader for the first time, it will automatically skip to APP "i-FlashDevice". If not, download and install it from Apple Store. Android and PC: use it directly. 【Storage for smartphone】Transfer your pictures, videos, music, files to SD/ Micro SD/ TF Card via this card reader to release iPhone/ smartphone/ PC storage like an external storage memory expansion. 【Best partner for camera-Share photos any time】With this card reader, you can viewing, editing, sharing pictures and videos in the Trail/Action/hunt tracking/SLR/Quadcopter Camera by the phone. If you have any questions about this product by WOPOW, contact us by completing and submitting the form below. If you are looking for a specif part number, please include it with your message.